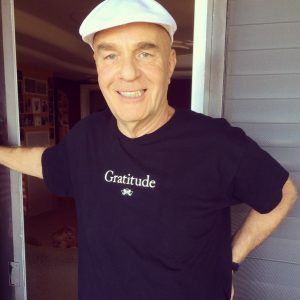 Since Wayne Dyer’s beautiful FB post on Gratitude, and subsequently about Positivity Designs, I’ve gotten asked about our connection more than a few times. For anyone who doesn’t know my story, I spent many a month in bed unable to function. Much of that time, I was crushed by depression and fatigue. There was even a time when I questioned whether I wanted to get better. Even though I couldn’t get out and didn’t have visitors, I knew it was crucially important for me to build a circle of positivity around myself – not an easy task when one is living in isolation. Thankfully, my only TV station is PBS. I watched Wayne Dyer’s specials for hours. I would even fall asleep to his words of wisdom, feeling they would heal me in my sleep. I’m fortunate in that I’ve had many wonderful people in my life who embody gratitude, compassion, kindness and love. I’m incredibly grateful for their impact on my life. When I started Positivity Designs, I gave many of them gifts of our t-shirts. Wayne Dyer was one of those people. It was a blessing for him to send me the beautiful picture of himself in our Gratitude shirt. When he posted the picture on FB with his insights about cultivating a habit of being grateful, I was blown away. It was a dream come true for me. Because of his post, and the attention our company received from it, my circle of positivity has become wider than I could have imagined. When people wear our shirts, they are expressing their positivity. They are advertising something beautiful, and they have sent me wonderful feedback about their experiences. I love every single one (you can read some of them if you check out our reviews). I no longer spend months on the couch, unable to go out or participate in the world. Though my health is still a work in progress, I am more thankful for the progress than exhausted by the work. If anyone reading this is debilitated by depression and fatigue, I want to tell you it can change. Reach toward the light, it is there – even if you can’t see it. Surround yourself with a circle of positivity however you can. The light in all of us grows by each and every effort. Reading this passage gave me goose bumps! It’s really an inspiration to hear about Alessa’s journey and the response these tee shirts are getting. Each time I wear mine, it sparks a conversation.